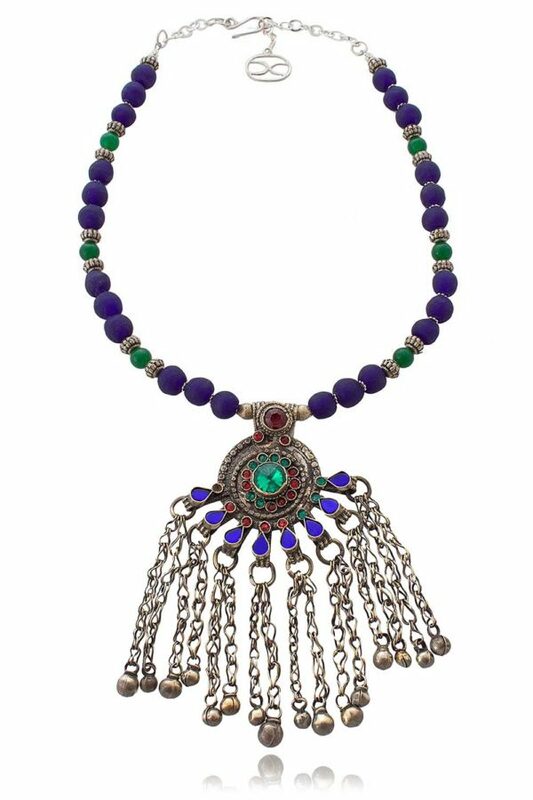 This exquisite Kuchi tribal peacock pendant encapsulates ruby red, sea green and royal blue glass nestled in raised bezel settings. The colours are simply breathtaking and are reminiscent of the wondrous peacock. The silver ghungrus are believed to attract the eye and also ward off evil spirits. 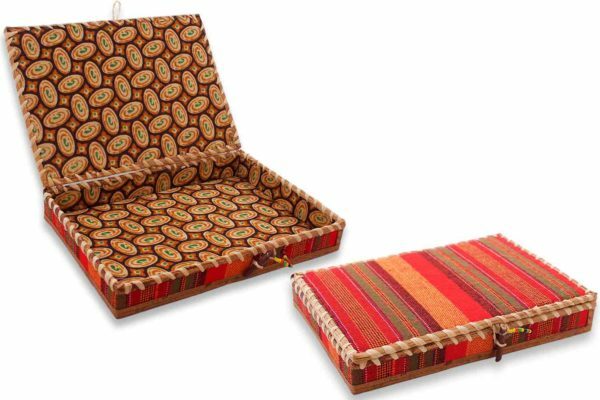 Pieces like this originally came from the nomadic tribes that wandered the border areas of Afghanistan and Pakistan, along ancient routes between the seasons, moving down from the mountains in the winter and back to their homes in the summer. The jewellery of these wandering peoples incorporates design elements from many cultures including those of India, the Middle East, Central Asia and the tribal areas of the former Soviet Union. 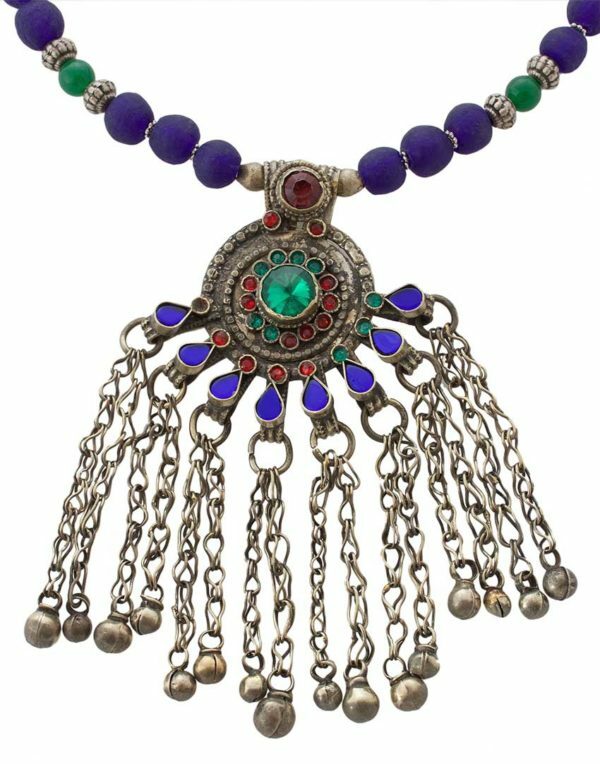 Kuchi jewellery in particular is renowned for its vibrant energy, colour and sparkling embellishments. The Ghanaian glass beads, from which the pendant is suspended, are made using centuries old methods by the Krobo tribe, which involves pouring fragments of recycled glass into reusable moulds and firing them in a very hot clay kiln. Jade is a symbol of serenity and purity, and is said to promote love, courage, justice and acts as an emotional balancer. It is thought to release negative thoughts and to soothe the mind. 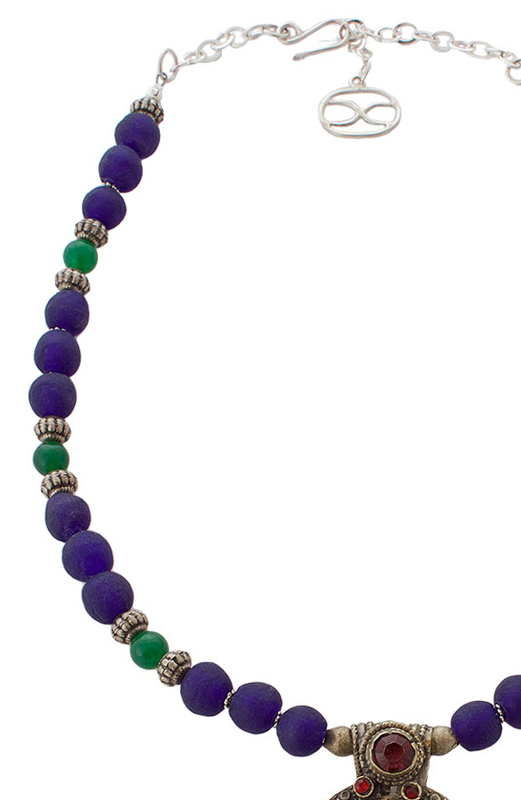 Jade is a protective stone, believed to protect the wearer from harm and to attract good luck, friendship and harmony. Bring out the graceful and elegant peacock within you with this fabulous statement piece, and expect all eyes to focus your way!